Whether you have got another job opportunity which is better than the current job, or you want to move on just for a change, you will have to be a little professional while going through the exit door. Resigning from the current job can be one of the hardest decisions of your professional life. Regardless of the type of relationship you have with an employer, a polite resignation letter is a must. A production manager is one of the most skilled people working in the production company. Due to this diversified field, there are always a number of opportunities available for a production manager to avail. However, this is not the case always. There can be many other reasons to quit the job. Your resignation letter totally depends on the circumstances in which you have decided to leave. However, it is not recommended to write negative statements in the resignation letter even if you are leaving in poor circumstances. If you have worked for a long time, you can opt for a basic resignation letter. However, if you have spent a number of years in the company, then your resignation letter should include something more than only basics. 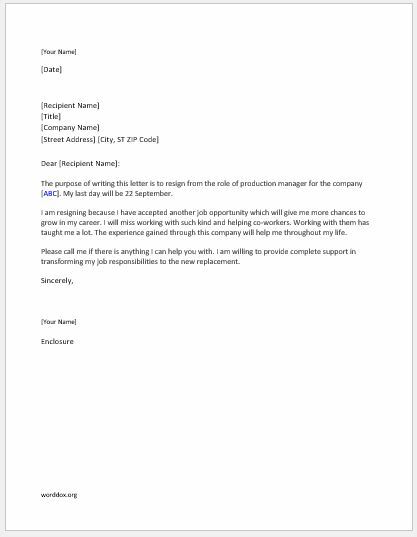 If you want to personalize your resignation letter to let the employer know about your decision of leaving, here is a sample production manager resignation letter to help you out. The purpose of writing this letter is to resign from the role of production manager for the company [ABC]. My last day will be 22 September. I am resigning because I have accepted another job opportunity which will give me more chances to grow in my career. I will miss working with such kind and helping co-workers. Working with them has taught me a lot. The experience gained through this company will help me throughout my life. Please call me if there is anything I can help you with. I am willing to provide complete support in transforming my job responsibilities to the new replacement.